The referee handled this situation with grace and humour – and received his handshake after all. Other failed attempts at shaking hands, however, have made it into the history books. I see friends shaking hands, saying how do you do. They’re really saying, I love you. Clasped Hands motive, Salt Lake Temple. – Image source: http://www.moroni10.com/lds/temple_tour/symbols/clasping-hands-motif.html. 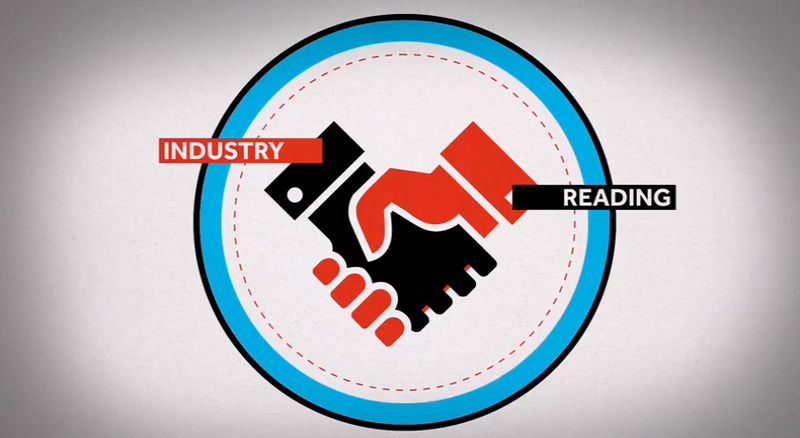 Just how charged with meaning the handshake’s symbolism is, becomes clear when one considers its use more broadly, including in iconography. A good example for that can is the Salt Lake Temple, the temple of the Church of Jesus Christ of Latter-Day Saints (LDS), more commonly known as the Mormons. Not like the covenant that I made with their fathers on the day when I took them by the hand to bring them out of the land of Egypt, my covenant that they broke, though I was their husband, declares the Lord. This is a rather different handclasp, of course – one in which the hands involved belong to entities of very unequal standing and power, creating a firm, oath-like bond between them. Of course, just to be difficult, the two different types of handshakes cannot always be kept separate. The current Wikipedia entry for ‘Women’s rights‘, for example, shows the following image of a Roman sculpture, in the collection of the National Roman Museum – Baths of Diocletian in Rome (accessed 30 June 2014). 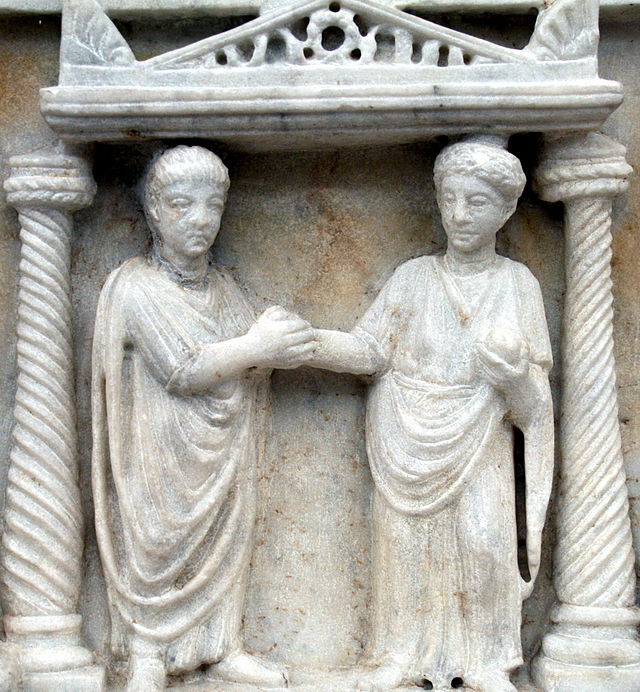 ‘Couple clasping hands in marriage, idealized by Romans as the building block of society and as a partnership of companions who work together to produce and rear children, manage everyday affairs, lead exemplary lives, and enjoy affection‘. A romantic view, explaining the concept of a manus (= ‘hand’) marriage, yet strangely neglectful of the fact that in Roman marriages, too, there was, of course, a significant power imbalance, to the advantage of the male. As a matter of fact, the clasped hands, the datae dext(e)rae in Latin, are a common part of Roman iconography, whenever it comes to bonds that are tied in relationships characterised by power imbalance. The Latin term for such bonds, potentially sealed with a handshake, is fides – a term that eventually became the English word ‘faith’ (and thus continues to be used to describe a bond, a mutual relationship, between entities that are thought to be of unequal power). The abstract concept of fides, when represented in Roman iconography, usually appears with the datae dext(e)rae. 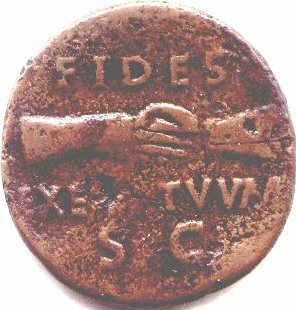 One such example, commemorating (or invoking) the fides exercituum (‘trust of the armies’), was issued under Vitellius, the short-lived Emperor of A. D. 69. When he heard that the men were Trojans, that their leader was Aeneas, the son of Anchises and Venus, that their city had been burnt, and that the homeless exiles were now looking for a place to settle in and build a city, he was so struck with the noble bearing of the men and their leader, and their readiness to accept alike either peace or war, that he gave his right hand as a solemn pledge of friendship for the future. A formal treaty was made between the leaders and mutual greetings exchanged between the armies. Latinus extends his hospitality to the Trojan newcomers, foregoing alternative options as to how to welcome the foreign intruders of his territory. This alternative interpretation of the handshake, focusing on the uneven spread of powers among those who shake their hands (or get coerced into doing so), is a fairly universal one. An expression of that, in political iconography, could seen, for example, in the logo of the Socialist Unity Party of Germany (‘Sozialistische Einheitspartei Deutschlands’, SED). The party’s symbol – clasped hands in front of a red flag – was designed to remind of the unification of the Communist Party (KPD) and the Social Democrats (SPD) into this new structure. As a matter of fact, however, this unification of the two parties was anything but uncontroversial or entirely voluntary (certainly from the perspective of the Social Democrats). Returning to Ammianus Marcellinus’ report, one may now understand that, very clearly, Nebridius and Julian applied fundamentally different interpretations of what a handshake, in public, in a charged environment (a ‘photo op’, as one would call it now), could mean. For Nebridius it implied protection for him (as a suppliant/client) through Julian’s patronage. Julian, in turn, offered an interpretation of the handshake as an expression of friendship (not necessarily in the Roman meaning of the term, implying, again, patronage), reserved for special people in his life. The bottom line? Unlike in Louis Armstrong’s beautiful song, it is not only friends who can be seen shaking hands: any iconic display of a handshake must raise the question: are those who clasp hands here equals, or is this an attempt at forming a bond, forming a relationship with an unequal power balance? This entry was posted in Prose and tagged Fides, Friendship, Handshake, Iconography. Bookmark the permalink.